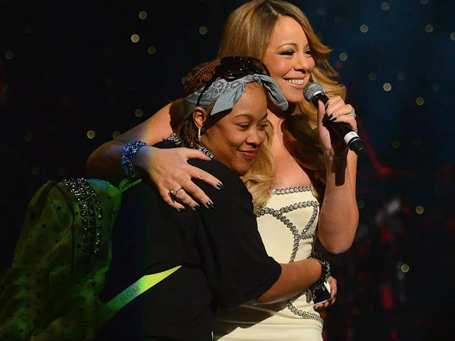 Da Brat says her BFF Mariah Carey has not been paying her bills for years and wants a judge to shut down the woman who is trying to comb through her finances. On November 5, Da Brat filed court docs in her bankruptcy responding to demands she turn over documents relating to any money she was paid for work - or support she may have received - from Mariah or Jermaine Dupri. The rapper says that while Mariah and Jermaine are good friends of hers, there are no financial transactions between them. The rapper is demanding the judge shut down the creditor's attempt to have her turn over numerous documents relating to her income, bank records, and various financial documents. As The Blast first reported, Shayla Stevens - the ex-cheerleader who won a $7 million judgment against the rapper over a nightclub assault - filed court docs demanding to be allowed to examine Brat's finances. She wants Da Brat to turn over docs relating to any relationships or work with others "(whether compensated or not), including but not limited to her public statement that she has the ability to obtain funds to pay Plaintiff in this case from either Jermaine Dupri or Mariah Carey". Stevens wants to know if Carey or Dupri have been supporting Brat over the years since she was hit with the massive judgment. Da Brat owes Stevens $8,155,731 - which is the $6 million verdict plus interest - and wants the court to allow her to comb through her finances to plot out her next move against the rapper. The case is ongoing. There are not yet comments to this article.